Tony Bellew will make the first defence of his WBC cruiserweight title against American BJ Flores at Liverpool's Echo Arena on 15 October. 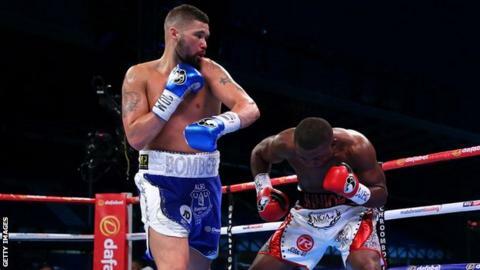 Liverpool's Bellew, 33, won the title with a third-round knockout of Ilunga Makabu in May at Goodison Park. Flores, 37, has won 32 and drawn one of his 35 fights, but has never lost by knockout in his two defeats. "I am going to smash BJ Flores to bits and be the first man stop him," said Bellew, who has 27 wins from 30 fights. Californian Flores is fighting for his second world title, having lost to Beibut Shumenov for the WBA cruiserweight title last July.